In the eastern part of the Tibet Autonomous Region, China is confiscating lands at a low price and then reselling at a profit to Chinese developers. Newly built apartments in these lands are then sold back at high prices to the Tibetans from whom the land was first taken. The pretext of Chinese authorities for this policy is that these lands belong to the local government and the Chinese Communist Party. People who refuse to comply with this policy have been threatened with imprisonment, while protests have been suppressed. Officials in an eastern county of China’s Tibet Autonomous Region are confiscating land at a low price from local Tibetans for re-sale at a profit to Chinese developers, meanwhile threatening to jail all those who refuse to sell, according to a local source. 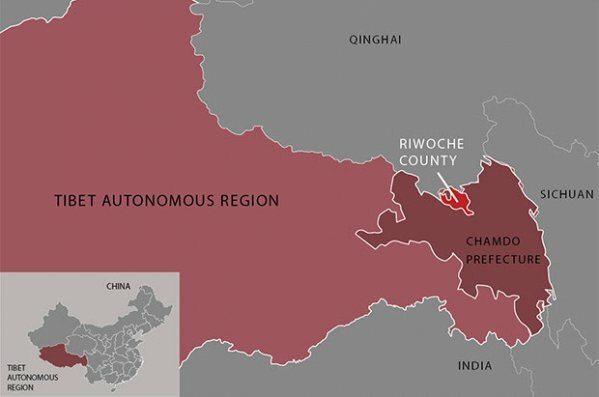 The move by authorities in Riwoche (in Chinese, Leiwuqi) county in the TAR’s Chamdo (Changdu) prefecture is being made with the excuse that the land belongs to local government and the ruling Chinese Communist Party, a resident of the area told RFA’s Tibetan Service. “They offer compensation at a nominal rate of 25 yuan [$ U.S. 3.74] per square meter of land, with anyone refusing to sign on these terms threatened with jail time,” RFA’s source said, speaking on condition of anonymity. “The same piece of land could easily bring from 1,500 to 2,000 yuan [$ U.S. 224.57 to 299.42] in the current market,” the source said. Land taken from Tibetans at the low rate is then sold to Chinese developers at a profit, the source said, adding that newly built apartments are being sold back at high prices to the Tibetans from whom the land was first taken. “These officials are secretly colluding with the builders to make profits at the common people’s expense,” he said. Word of the development project was first given two months ago at a time when few members of the public would hear of the scheme and object to it, the source said. “Riwoche county officials called a meeting of local Tibetans at the end of May and announced their intention to take over the land for development,” he said. “But they held the meeting at a time when most of the area’s Tibetan residents were away in the hills collecting cordyceps,” a valuable medicinal fungus, he said. Officials told Tibetans that anyone refusing to accept the offered compensation would be jailed, warning further that anyone going to Beijing to plead their case with central government authorities would also be jailed on their return. Calls seeking comment from Riwoche county offices rang unanswered on Thursday.